Hanging paintings or framed photos can be frustrating when you are by yourself. It’s hard to stand right up against the wall and know what it looks like from across the room at the same time. I’m always paranoid that I’ll have to move it to another position that reveals the hole I just made from my first attempt. Friends of mine live in a log house, their decisions are a little more permanent. They don’t get to patch and paint every few years. I kind of think the “he” throws off the general tone of the comic from what I’ve seen. It’s just aesthetic I guess though. Funny as heck! SONIC DUCT TAPE CANNON! When I’ve got to hang something up by myself, I use a little leveler. Unless the object is too heavy, then I’m more likely to drop it on my toe. 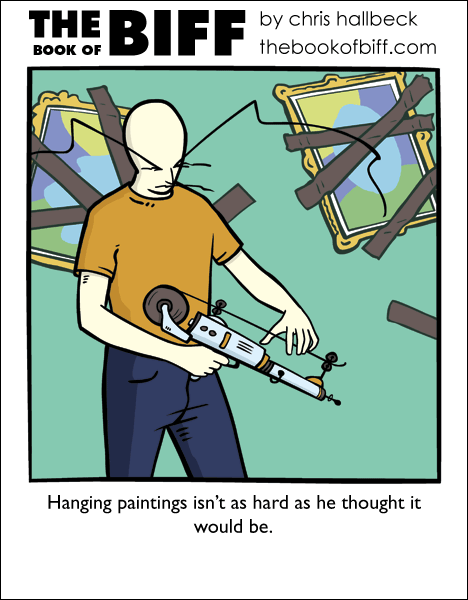 It should read ‘Hanging paintings wasn’t as hard as he thought it would be’. It makes sense how it is now, but using ‘wasn’t ‘ makes it sound better grammatically, I agree. …snaps, I was gonna make a comment about the bronzed Rembrandt and completely forgot. He like electronic stuff to much. That’s one helluva tape gun! I hate hanging stuff on the wall, too – I use rail mounting systems, instead. That lets me play with the laser level (something Biff should NEVER be allowed to touch! ), set the rails, and be done with it forever more. It makes sense – leave it alone. I think the grammar is perfectly matched with the childlike innocence of Biff in learning and exploring his surroundings. It’s clear and concise everyday speech. That is the most intense tape gun I have ever seen. I need one, is it powered by electricity or the innocents and love of Biff? I hope electricity..not much innocents here…ha ha ha. Awesome. I high-powered tape gun, likely capable of insta-fixing everything in a 10 mile radius on one roll of tape. @reynard61: You only need two tools in life. If it doesn’t move but should, use the WD-40. If it does move but shouldn’t, use the duct tape. I live alone and hanging paintings is not a problem. I just eyeball where I want the first one to go, then I use the top of it as a reference point. Then I face the next picture against the wall and pull up on the wire and then measure the distance from the wire to the top of the frame, and then I know that’s how far down from the top line to put the next hook. As far as horizontal positioning, I just add up the widths of all the pictures, subtract that from the width of the wall, and then divide that by one more than the number of pictures. That gives me the inter-picture (and picture-to-corner) spacing S, and so working from the outside in I start at S, add half the width of that picture to get the horizontal position where the nail should go, then hang the picture, and from its next edge I add S, and so on. By doing one on the left and then one on the right, I’ll end up with a nice balanced gap in the middle (assuming an even number of pictures). For an odd number of pictures, for the last one I just take the midway point between the right edge of the rightmost left and the left edge of the leftmost right to get where to hang the center one. It’s not totally precise but it’s close enough. Sometimes I end up with a picture higher or lower than the top-line (since my initial measurement sometimes doesn’t tense the wire enough), in which case I just have to make another hole directly above or below the original one. I don’t keep paintings in my room because it woulod drive me mad if they were not perfectly straight. @reynard61: No need to use the screwdriver! Just duct tape the pieces together or WD-40 them apart! Wrench, same thing! Saw? WD-40 the wood in half! These two tools solve EVERYTHING! Now I remember, I once used Address before. It was driving me nuts. I was talking about using he instead of Biff. @Amateur Grammar Nazis – How about you actually know what you’re talking about before you start tripping over perfectly correct grammar? Looks like Biff finally made a heavy-duty, bettery-powered version of the lightning-powered tape dispenser. Is that a painting of a member of the Blue Man Group? Yeah, I’m sure it’s just abstract oval art, but it kinda looks like one of them, except they don’t wear green shirts. I agree w/Trevor on that one. understand the opposing argument before responding. @Trevor, using “he” instead of “Biff” is a matter of diction, not grammar.